Very interesting. If you haven’t done so already, read George Marshall’s “Don’t Even Think About It”, you’ll love it. I took the test and came out with a 40/60 “mildly conservative” rating. 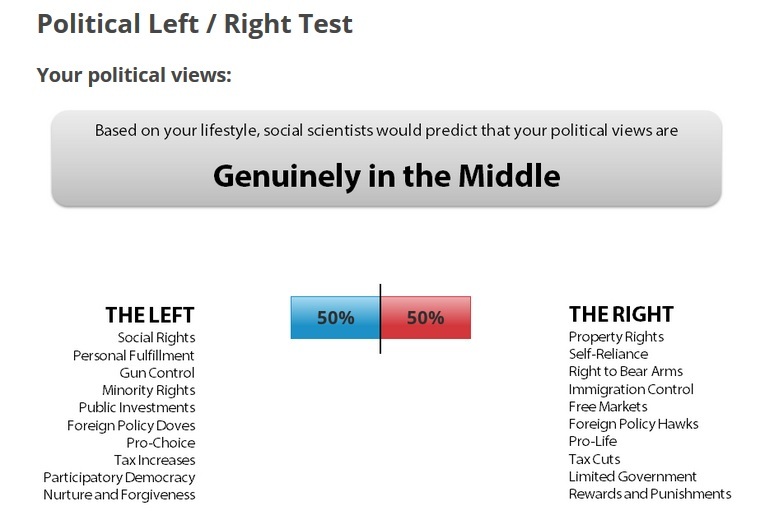 I can assure you that I’m much more than “mildly” conservative. It’s not completely inaccurate, but I know which questions got me the 40 percent Liberal assessment, so if I had wanted to cheat, it would have been very easy. Conservative folks have hearts and compassion too, but are able to see life more realistically and logically than their Liberal counterparts, in my humble opinion. “In some sense, it seems that politics is being determined by class.”…class warfare is also a socialist platform plank and as proof I offer 8 years of Obama divisionism by class into “victim groups”, the constant refrain of “the rich are our enemies…GET THEM! I’ll help you.” [I’d heard this was some variety of “Fabian socialism” or a derivative but IDK. It may just be Obama’s socialism]. IMO he took the “working class” and their loyalty to the Ds for granted and Noonan’s piece and that video explain how they “woke”. Trump has done what previous pols haven’t managed–he’s separated me from loyalty to politicians simply for saying they’re “like me” regardless of what they do. For that, I thank him as well as his good policies [not his bad ideas though]. I support policies that “are like me”, advancing what I believe is best for all of us and the nation [even if not necessarily best for me individually] for JFK got it right when he said, “A rising tide lifts all boats.” A prospering nation is a “rising tide” that makes all of us better off regardless of class or politics. I recently encountered what you refer to as the protected viewpoint in a discussion regarding the regulatory increase to fuel cost as a result of green energy policies. I said that gasoline is largely not a discretionary expense and that travel for pleasure would be curtailed, but not gasoline as a regular living expense. Instead rising fuel costs would be taken from other household budget items like food and clothing. I had a reply to that from someone who suggested that Americans would do such things as buy more fuel efficient vehicles, move closer to their workplaces, and use public transportation. In turn I pointed out that these things are options only for the affluent. Poor Americans don’t usually have the option of replacing their cars with new ones. Moving can be a major hardship, even when a desirable home in their budget is available. And public transportation is seldom an option to workers on second and third shifts, or for households where parents must take the children to childcare prior to a work shift. I’ve yet to get a response to my reply and I suspect that the commenter had simply never thought about how, in America, NOT using a private automobile can be a luxury. Took the test- ended up mildly conservative (60 to 40). Lots of assumptions in the test- like all these tests. For instance, I would never voluntarily eat monkey meat. But, if I was in a prison camp, or on a desert island and it was all there was… well different story. ALL of the questions were that way- I could see myself answering differently depending on the situation or my mindset. Kinda stupid- like all these tests tend to be. Anyway- I think the leftist/rightist thing gets down to preferred government control level. I could care less what viewpoints somebody has as long as they keep them from interfering with my own life. And there’s the problem. Like a group of second graders who have been allowed to make their own rules, our government has gotten carried away and leftists (and even confused rightists) have slipped in rules that only limit our freedoms because of some event that caused them to decide to make a law to prevent it ever happening again. Rightists unfortunately miss the point that those rules only apply to those who follow the law. The lawless are going to break rules anyway. Let’s stop making rules for the exceptions- they are already punishable. Test assumes those on the right are closed minded and unkind. No way I’m 60% Left!